We enjoyed the red carpet treatment given by the Goodman Community Center on December 9th, where supporters were thanked and honored with delicious hors d’oeuvres and desserts by Working Class Catering, delightful live music by Luke Bassuener, and elegantly formal greetings by hostesses from GCC Girls Inc. It may have been cold outside but inside the Center the warmth was abundant. A slide presentation and remarks from Center Director Becky Steinhoff gave programs and participants a chance to shine. A photo booth operated by Focus Photobooths produced souvenirs for guests, who were invited to wear a tiara or crown. Your club organizers Sarah White (left) and Ann Waidelich (right) preferred to go hatless. Thanks, Becky, Kristin, Margo, and all the rest of the Goodman staff who give our East Side History Club such a great home. We are more aware of the truly vast array of programming going on (nearly around the clock) at the GCC. Keep up your good work! 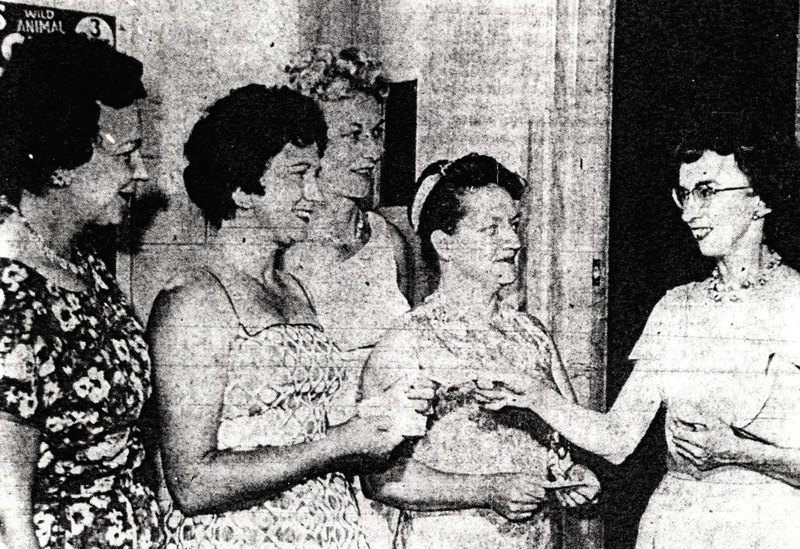 Dorothy (Mrs. L. M.) Haines, shown at right, received the “Woman of the Year” award at the Club’s 39th annual banquet , June, 1964, as her mother, Mrs. Marshall Browne, did many years before. Others in the photo (from left) are Mrs. Marvin Olson, Mrs. Cletus Casey, and Mrs. William Ludwig. Dorothy Browne Haines was the guest speaker at the November 2010 meeting of the East Side History Club. Her mother was the founder of the East Side Women’s Club and Dorothy was a member for many years. Dorothy is a lifelong resident of Madison. Her parents, Marshall and Vera Browne owned the East Side Print Shop, “Printers for the sunrise side of Madison and home of The East Side News”, at 2004 Winnebago Street. The newspaper was published from 1924 – 1963. Dorothy graduated from the UW with a degree in Journalism. She and her husband moved to Whitewater where he was a lawyer in private practice. They had two sons. Unfortunately Lenard died young and Dorothy returned to Madison to raise their boys: living at first with her parents at 1442 Morrison St and then in her own home at 1845 Jenifer Street before moving to Monona. She earned her living as a reporter/editor of the East Side News and eventually Dorothy and her brother bought the print shop from their father and ran the business, calling it “Impressions”, until they retired in 1986. As I mentioned, both Dorothy and her mother were members of the East Side Women’s Club. They hold another distinction in common besides being mother and daughter – they were both elected Woman of the Year by the Club. Vera Browne was the first one in 1941 and 22 years later Dorothy received the award. They both received lovely silver serving dishes engraved with the award description and their name. Before Dorothy spoke we recited, together, the Collect written by Mary Stewart, that was recited before every meeting of the East Side Women’s Club. Vera and Marshall Browne had set up their printing and newspaper business at Schenk’s Corners and Vera noticed that the news of the community seemed to center around the schools and churches, but no social/civic group that brought them together. Alma Hall, who ran a Schenk’s Corners grocery store with her brother, collected news items for the East Side News, agreed with Vera that it would be a good idea to have a club where the ladies could meet and have fun together, regardless of job, business, school or church backgrounds. They invited others to meet with them for the purpose and 26 attended the first meeting in August 1925. Vera was elected president, a constitution was written and plans for activities were made. A contest to name the group resulted in calling it the East Side Progressive Women’s Club. That name was changed in 1935 when Progressive became the name of a political party in Wisconsin, and the word was dropped from the name. Regular twice-monthly meetings brought them together for programs, activities, and always refreshments. In later years the meeting dates were changed to once a month, and the final meeting was held in 1989. The meetings generally consisted of a speaker and some music performed by community members AND a “dainty lunch” which was prepared in the kitchen at the back of the room out of sight until the meeting closed and they wheeled it out on a cart. Two “greeters” were at the door for every meeting to say hello to each person entering. Each member was assigned to serve on the hostess committee once a year, and these assignments were printed in the yearbook, which also included meeting dates and information. A Sunshine Chairman took care of sending “Get Well” or “Sympathy” or other cards to members as appropriate. Other committee chairs included membership, program, civic, house, publicity, hospitality, auditing, ways & means, policy, historian and Red Cross. Cards and card parties were big from the beginning. Sometimes they gave public card parties for men and women as a fund-raising activity. Speakers’ subjects ranged over various fields – Dr. Carr, City health officer, on care and nurture of children; Bess Tyrell of the Home Ec Dept. at UW on Fine Linens; Alice Rentschler of Madison Gas & Electric spoke, Kathryn Counsell gave a cooking demonstration in the home ec room at Lowell school. A Halloween party – in costume – was a regular event. From time to time we would have a fashion show, with the models wearing clothing from one of the downtown clothing stores. Other times a group of children would perform. From the beginning, the East Side News had published meeting notices and reports and publicity but when it ceased publication in 1963 it was necessary to communicate with the members. So I started a mimeographed newsletter that was mailed to the members. Mimeograph was the multi-copy tool of the day — messy, time-consuming but logical and less expensive than printing for less than 500 copies. Ginny McGinnis had given me a used Mimeo machine, which I had in my basement. I had to learn how to cut a stencil, making corrections was a pain. I can’t remember how we got the newsletter addressed for mailing … probably with an addressing machine in the print shop, which involved making a plate for each address. The newsletter continued for several years. It was named the Chatterbox but I cannot locate any copies. I hope someone has a few filed away in their attic. This was the first of a series of newsletters that I wrote and produced over the years for other organizations. Social events were popular. The annual end-of-the-year banquet in early years was a really dress-up affair – formal gowns in formal places such as the Loraine Hotel. After the ESBMA built their new clubhouse on the shore of Lake Monona the meeting hall was an inviting location for the banquets, made more impressive by the work of many committees in decorating and creating an atmosphere. A theme was selected early and committees worked at homes to create decorations, for the table and the setting, and favors for the attendees. For instance, in 1960 the theme was “Spring Garden for the Belles” and guests entered through a bower of flowers and the room was decorated with trellises with climbing roses. The tables were decorated with paper flower corsages, which were given to each guest. The podium was a garden setting of lawn furniture on green grass. Louise Marston, society editor of the Wisconsin State Journal, was invited as toastmistress for several years. Mother and Daughter or Mother and Son banquets were also annual events, with a toastmistress and a spread of photos in the society pages of the daily newspapers. These clippings were what was saved and made their way to the scrapbooks of the time. (my own included) Enjoy them, but think of them as only the icing on the cake – the real essence of the club was the ever-flowing series of programs for the members and projects for the community. •The club furnished a room at Dane County’s guidance center for children. In 1961 a cookbook was printed and assembled from recipes turned in by members. It proved to be a good revenue source – and a treasure for us to keep. A Christmas “Tea” — a regular event for several years. It raised money for scholarships. Members baked cookies, which were sold, and buyers would have the opportunity to taste them and have a cup of tea or coffee when they came to buy. A long table was set up for display with a member “pouring” the tea from a fancy pot at each end. The cookies were so popular that some members began to depend on buying their Christmas cookies there instead of making their own. Later a salad luncheon was put on. Although they had no official connection with the East Side Business Men’s Association, which had a clubhouse on Atwood Avenue (across from St. Bernard’s church), they held their meetings at the club house and assisted the business men, at times, in return. Cooperation with the East Side Business Men’s Association was ongoing, so it was not surprising that in 1940 the women had a tent set up for them at the Fall Festival and served home-made pie and coffee. The Festival extended over several days, which meant a lot of organization to have the pies and women to serve them. That was a big hit, and continued for many years. A spring festival that included a Home Talent Show at East High School netted $1,300 profit. That enabled them to set up a public playground with equipment on Atwood Avenue near It was close to Atwood Avenue north of Sugar Avenue and Olbrich Park — the first such in Madison east of the Yahara River. They donated it to the Madison Athletic Department. I can remember playing on it a few years later – swings, slide, teeter-totter, metal turning bar and the spinning, foot-powered merry-go-round. In 1930 children infected with tuberculosis were hospitalized at Morningside Sanitarium for extended periods and were separated from their families. Under the leadership of Daisy Breyer, the club provided Christmas gifts that were taken to the Sanitarium along with a caroling party. This activity continued until 1969 when the last child left. After that a silver collection (coins from your purse) was taken at the Christmas meeting and was split among East Side charities as decided by the Board of Directors. Beginning in 1936 a one-year UW tuition scholarship was given to a senior girl each year, starting at East High and adding one semester scholarships to Monona Grove and LaFollette High School girls after those schools were built. The years of World War II were busy ones for the group. During 1947-48, Mrs. Norman Wang had 55 boxes packed and sent to war relief. And in those years Dr. Charles Kincaid, Madison health officer, told of the need for chest x-rays. Mrs. Lawrence Ellis, president in 1949-50, led a campaign for canvassing the entire east side. All members were called into service and 96% came and helped in the X-Ray unit. The rest of the city followed suit.